Did A Trump Aide's Tweet Violate Federal Law? The Answer's Not Clear — Or Easy. Last weekend, a Trump staffer was accused of violating the 1939 law barring federal employees from certain political activities. But the jury's still out over whether he actually did. What Is The Hatch Act? And What Does It Mean For Government Employees And Twitter? This March 28, 2017, photo shows Rep. Justin Amash, R-Mich., leaving a closed-door strategy session on Capitol Hill. 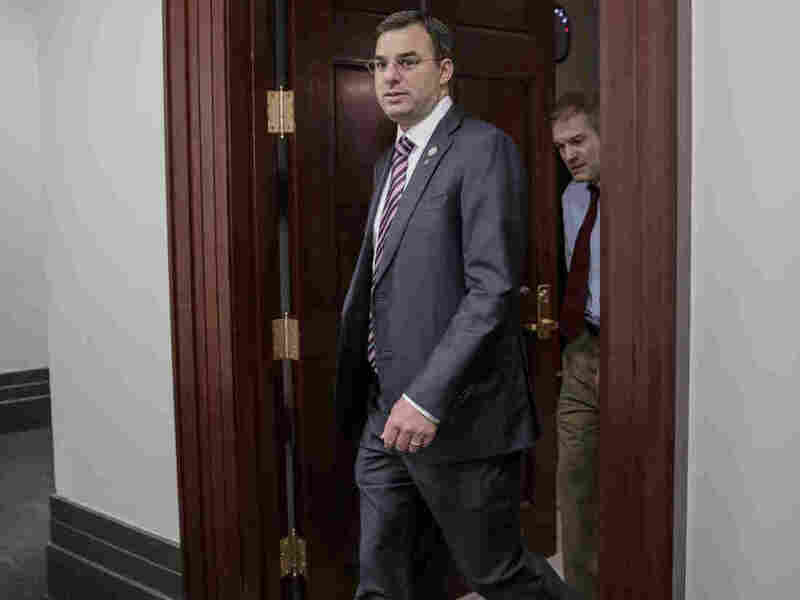 A top aide to President Donald Trump urged the primary defeat of Amash in a tweet. It's been a week now and the issue is still unresolved: Did a tweet from Dan Scavino — Donald Trump's golf caddie turned presidential social media guru — violate the Hatch Act?
. @realDonaldTrump is bringing auto plants & jobs back to Michigan. @justinamash is a big liability.#TrumpTrain, defeat him in primary. The Hatch Act is a 1939 law barring federal employees in the executive branch (except the president and vice president) from participating in certain types of political activity on government time or using the government's resources. The tweet in question is pretty aggressive. It read: ". @realDonaldTrump is bringing auto plants & jobs back to Michigan. @justinamash is a big liability. #TrumpTrain, defeat him in primary." Scavino was going after Michigan Republican Rep. Justin Amash, a member of the House Freedom Caucus, a group President Trump recently called out over their lack of cooperation and support in the recent struggle to pass a Republican Obamacare replacement bill. And just about as soon as it was sent on April 1, legal ethics experts had some problems with it, even calling for Scavino to be fired. And a group called Citizens for Responsibility and Ethics in Washington (CREW) filed an official complaint with the U.S. Office of Special Counsel, claiming that the distinction between Scavino's personal Twitter account and his professional one was virtually nonexistent. "The picture that came up when he used that is him standing in front of the Oval Office with the presidential flag," said Noah Bookbinder, CREW's executive director. "He also had a picture on his page which had Donald Trump speaking in front of the presidential seal. ... And so essentially the message that is going out is: this is the White House." Scavino's since changed the photos, and his bio. The Office of Special Counsel says that the Hatch Act prohibits certain federal employees from doing things like running for public office in a partisan election, or engaging in political activity while on duty, in the workplace, etc. While it seems straightforward enough, Kathleen Clark, an ethics law professor at Washington University in St. Louis, says the law can actually get pretty intricate when it comes to determining whether an employee has violated it. "I can't actually tell whether it was a violation of the Hatch Act because I don't know where he was when he tweeted about that congressional campaign," said Clark. She pointed out that there are some distinctions about when a federal employee can politick, and other times and places when they can't. "If Scavino tweeted from a government office, or in a government vehicle, and arguably from a government communications device... then it would appear that he violated the Hatch Act. It's not so clear to me that merely doing what he's permitted to do as a government employee — engage in partisan political activity away from the office, not using his public authority — it's not clear to me that he's violated the Hatch Act." Jonathan Turley, an ethics lawyer at George Washington University, said the fact that hairs that fine must be split to determine a violation of the Hatch Act speaks to the law's flaws. "The problem with the Hatch Act is it often comes down to a reading of Green Eggs and Ham; if you're in a goat with a boat you're probably in violation, but not if only one applies." Turley argues that things are just blurrier in our current digital lives. Most of us are constantly mixing professional and personal communications all day, often from one device, but through multiple social media accounts. "It's very hard for members of the White House staff to remember to separate platforms." Bring it on. I'll always stand up for liberty, the Constitution & Americans of every background. You can help here: https://t.co/ECxQGXE5XH. Turley argues that critics parsing the details of Scavino's personal Twitter feed might be trying too hard. "When you start whether to debate that a picture on his personal account looks a lot like his official picture, you know you're really chasing this rabbit down a really deep hole," he argues. "He is in fact a human being and his pictures will look the same." The Office of Special Counsel refused to comment on the tweets in question, or say whether they've launched an investigation into the tweets, after CREW's complaint. And since last week, both the White House and Scavino himself have stood by all the tweets. But that complaint was filed with the Office of Congressional Ethics, as the Hatch Act does not apply to members of Congress.